The Buvuma Islands are a chain of more than fifty islets located a few kilometers off the northern shore of Lake Victoria; the main island, Buvuma, measures about 200 square-miles (517 km²) with a population of nearly 20,000 people. 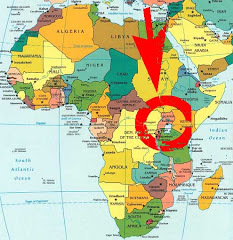 The area is very poor compared to other parts of Uganda. There are high rates of illiteracy and the work centers predominantly around the local fishing industry. There is an unreliable ferry to the mainland, and until recently, the Buvuma Islands did not have a school. For decades, children of the islands struggled to receive an education, often using fishermen’s boats and canoes to get to their classes, and at times failing to get transport back home. This led to many children ending their education early to join their parents in fishing the expanses of the lake. The Rotary Club of Bweyogerere Namboole first learned about this issue when reviewing the poor national exam results of the Buvuma District. 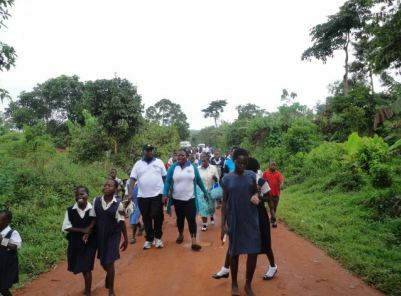 After conducting a needs assessment, the club resolved to address the lack of access by soliciting funds to buy a school boat to transport children from surrounding communities to a recently constructed school on the main island, and then back home, just like school buses of Kampala. 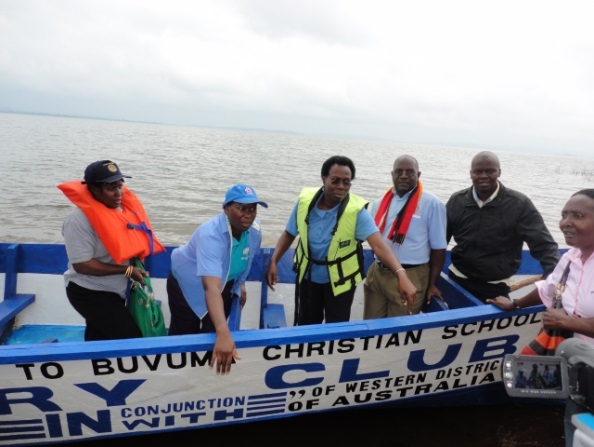 The Rotary Club, in partnership with an handful of Rotary Clubs of Western Australia, donated alarge power boat to Buvuma Christian School on the main island to safely transport children from surrounding islands to the school every morning and return them back home. The project has already seen great results. The number of children regularly attending school from surrounding islands rose from 120 to 450, while the number of teachers increased from 8 to 26 as a result of secure and assured transport to and from the school. In a bid to guarantee safety for the children on water, The Rotary Mariners of East Africa (RMEA) Uganda Fleet, affiliated with the International Yachting Fellowship of Rotarians donated 40 Life Jackets to be used by children while on water. 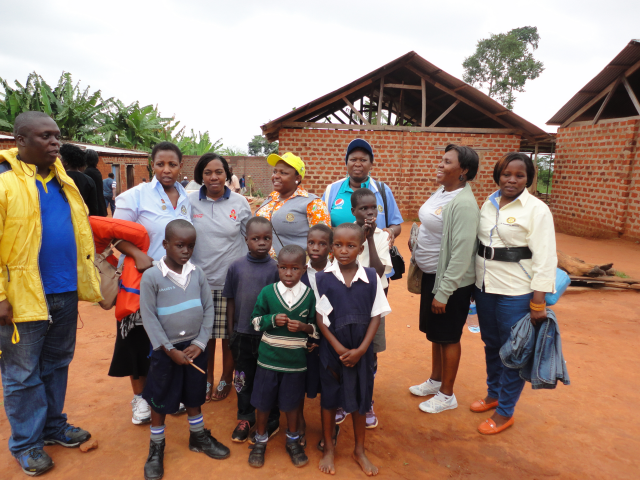 The handover was completed in a colorful ceremony in which many Rotarians were present. RMEA’s mandate incudes the promotion of boating safety in East Africa and presentations have been given to Rotary Clubs in Benin, Tanzania, Rwanda and Kenya. Seeing the need to do something about the safety of the boaters in East Africa, RMEA received 1000 more lifejackets through the Lifejackets for Life Programme, an initiative of theInternational Yachting Fellowship of Rotarians. The new boat and safety equipment have enabled even more children to register for studies, and has rendered the use of one school boat insufficient to meet the new demand, especially as children who abandoned their studies early are encouraged return to school. 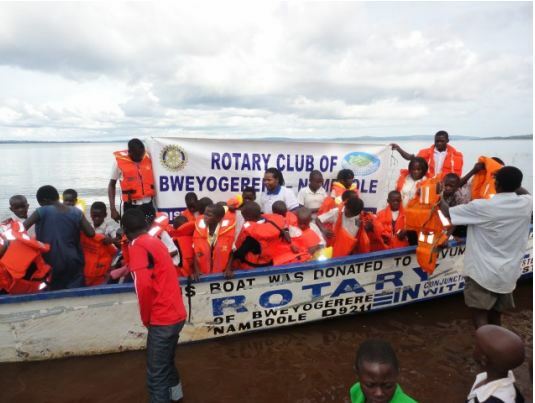 The Rotary Club of Bweyogerere Namboole is now seeking for funds to purchase a second power boat for the Buvuma Christian School, and looks forward to working with RMEA and IYFR in the future. The International Yachting Fellowship of Rotarians began in England in 1947 and has grown to 90 fleets, with more than 3200 members in 32 countries. IYFR’s first international event was held in 1964 in conjunction with the Rotary International Convention of Toronto, Canada. Since that time, the fellowship has expanded greatly with new fleets being added under the enthusiastic leadership of the many Past International Commodores who have been elected from a diversity of countries within the world of Rotary. I attended two functions of this project and we are looking forward for more assistance.